I’ve talked about Panda pillows pretty extensively on this site. Their memory foam pillow is one of the best pillows you can buy – hands down. It tops my list of Best Pillows and with good reason. I’m going to explain why this will be the last pillow you buy for at least a decade and why Panda Life are a company that everyone should be behind! They specialise in bamboo bed products that ensure you have a sound, comfortable sleep. Panda Life chose bamboo since it creates bed linen that’s comfy, stylish but also eco-friendly (a huge motivator for the company) and were inspired by bamboo fabrics they found in Southeast Asia. Even better, Panda Life donate a portion of their profits to the World Wildlife Fund (WWF) to help maintain the habitats of wild pandas. I first fell in love with a pair of bamboo socks I bought for work several years ago. They were the softest I’d ever owned. So naturally, my wife nicked them and I haven’t managed to get them back. It’s as soft as silk but it’s more durable. It stays crisp for longer. It needs much less ironing than cotton. It wicks away moisture (meaning moisture doesn’t stick to you or it). It dries twice as fast as other fabrics. One of the biggest reasons, which I mentioned earlier, is that bamboo is environmentally friendly. It grows around four feet a day – almost as quickly as you can cut it down. No harmful chemicals are used to treat bamboo. In my opinion memory foam pillows are the best pillows. The heat of your head makes it soften and mould to your shape, giving you ultimate support. It almost feels weightless. It’s a medium-firmness, so very comfortable. 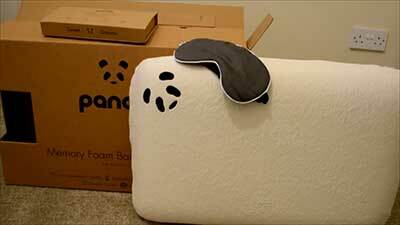 This memory foam is inside a bamboo pillowcase which is super soft, making it all even better. Its dimensions are 60 x 40 x 12cm. What this means is that it’s comfortable for any type of sleeper: back, side or front. So it’s made for everyone! The only people who I think might have a problem with it would be those with broad shoulders who tend to sleep on their side. To get the height that you need, you might need to put another pillow underneath this one. However, unless you’re well over six feet tall or a bodybuilder, you should be just fine. The other reason that I recommend this pillow to everyone is its 10-year guarantee. A usual high-quality pillow will last you around two years, three at the maximum. So the fact that Panda Life have a 10-year guarantee attached to this one is just bananas. You also get a 30-day trial with this pillow, which is perfect if it’s your first experience with memory foam. You can return it if it’s not for you within the 30 days and get a full refund. The Panda pillow isn’t even expensive for all the benefits that you get, it’s incredible value for money. So, please. For the sake of all the sleeping you haven’t done yet. Get yourself a Panda Memory Foam Pillow. You absolutely won’t regret it! How does this pillow compare to the eve pillow? I tend to move and sleep in all positions, mostly the side but also front and sometimes back. I see mention of the panda being a little tall for front sleepers, how does the eve compare in this respect? The Eve pillow is much the same in thickness so you might still have trouble if you’re a front sleeper. Hyde & Sleep do a great pillow for front sleepers if that’s what you’re after. That does look interesting but I’m not sure I like the idea of flipping the pillow for the different sizes. It’s also rather pricey and doesn’t seem to offer a trial period. Perhaps I’ll take a shot on the eve or panda and just see how it goes. I just need to somehow decide between the two! How I suppose to clean them? I’m afraid it will loose the shape and firmness if I wash in washing machine. Great question! The pillows themselves should just be spot cleaned, so a wrung-out sponge with just water. The pillowcases to be washed using a 40 Degree wash then can either be hung out to dry or tumble dried. We had just bought new pillows so we purchased the pillow covers. Do you use pillow cases over them? I wouldn’t because it’s likely other covers won’t be as breathable as the bamboo pillow covers Panda Life provides. I have just spent a night using my panda life memory foam pillow with bamboo cover and have to say I am very disappointed with it. After reading your review I ordered one along with two spare covers. I could not wait to go to bed that night and actually get a decent night’s sleep. Although I do agree that the pillow is a very well made quality item and at first comfortable and supportive, for me it got far far to hot. After only a couple of hours it was like sleeping next to a radiator that had been turned full up to max. Luckily I had kept my old latex pillow so reverted back to using that. The coolness of the latex was such a welcome relief. 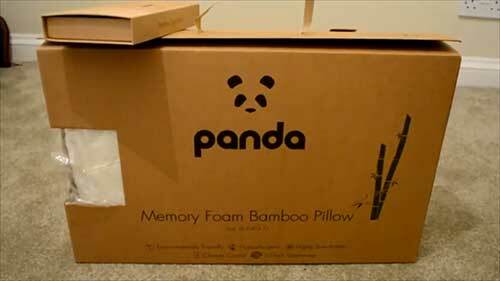 I can’t say how disappointed I was as I really did think with the bamboo cover panda life had solved the heat issues that imho will always be there with memory foam. Latex it is for me. Sorry to hear that Kelston! Can’t stop recommending it to everybody. We have ours for almost a year now and it’s superb.. I wonder if the mattress topper is the same quality? The mattress topper absolutely is the same quality. In fact, it’s featured on my List of The Best Mattress toppers. A unique pillow. Using bamboo on pillow sounds amazing. Thanks for sharing with us.